A great tool for any business, small or large, the Work Equipment Inventory will ensure your company never misplaces a single item. The simple Excel document helps you track any item as you simply enter the information into the pre-made template. The document was designed to save you time and energy by keeping track of the same base information, such as names and items that you would otherwise continue to enter each and every time. Customizing the document is a breeze, simply click the cells you want to change and enter new information. You can have your business running at peak levels by downloading the free inventory sheet today. Begin by familiarizing yourself with the “Equipment Inventory” tab and how it’s structured. There is a space for a specific item ID, item name, assigned person, issue date, and length of time issued. Once you have a good understanding of the information this Work Equipment Inventory template uses, you can continue to the “Settings” tab. Here, you will enter items to be used in the drop-down menu of the main table. These drop-down menu items were intended to help you store information to continuously reuse time and again. Instead of writing someone’s name, the item, or the item ID, they will be conveniently listed for you in these drop-down menus. In the “Settings” tab, simply list the names of as many employees and the items you want to track as you need. You can extend both lists by pulling the triangle in the last cell further down (make sure you highlight the last cell to see the triangle). Now, go back to the main table. Here you will see all the useful information again. Start by selecting a row and enter an assigned equipment ID number (using your own system). Next, enter the actual name of the item. Then, you will enter the person being assigned the item and the issue date. Finally, you will enter the number of days the item has been assigned to the person. You can use the pre-mentioned “Settings” items to quickly search through items for specific people or instance. You can use these menus to choose specific items and the Work Equipment Inventory template will display only the selected item. Instead of searching through a long list of items, you can just use this feature to find them instantly. 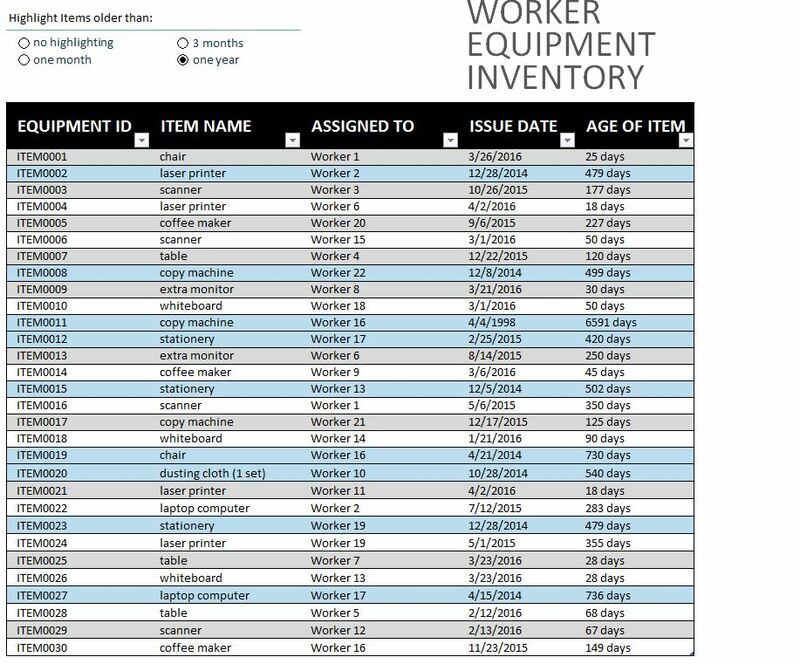 Using this free Work Equipment template, you will make your business more efficient and easier to keep track of your inventory.